The domain name Adora.com was registered in 1996 by Pearl One Media. Through the years, the domain displayed technology-related content including web hosting services. Around 2014, the domain’s lander became a “for sale” page, showcasing the keyword’s brandability and qualities. The owners sought $300,000 dollars for it. For some odd reason, the most recent content changed to a list of Adora dolls, and that’s when the company that makes them stepped in via the UDRP process. The Complainant in this case, Charisma Brands LLC, operates from AdoraPlay.com. Complainant claims common law rights in the ADORA mark dating back to at least as early as 2000. Complainant also has rights in the ADORA DOLL mark through its registration of the mark with the United States Patent and Trademark Office (“USPTO”) (e.g. Reg. No. 3,002,445, registered Sep. 27, 2005). During UDRP discovery, the domain’s registrar, Namecheap, stated that Adora.com has been with them since 2004, all while the self-represented Respondent cited 1996 as the important date of registration. DomainTools has retained 2001 as the oldest date of WHOIS information. In this exchange, the sole panelist at the National Registration Forum, seemed to accept that the Complainant had older rights than the Respondent’s registration date, and ordered the domain Adora.com to be transferred to the Complainant. Complainant is Charisma Brands, LLC (“Complainant”), represented by Deborah A. Gubernick of SNELL & WILMER L.L.P., California, USA. Respondent is Web Support / Pearl One Media (“Respondent”), Washington, USA. The domain name at issue is <adora.com>, registered with NameCheap, Inc.
Complainant submitted a Complaint to the Forum electronically on March 12, 2019; the Forum received payment on March 12, 2019. On March 13, 2019, NameCheap, Inc. confirmed by e-mail to the Forum that the <adora.com> domain name is registered with NameCheap, Inc. and that Respondent is the current registrant of the name. NameCheap, Inc. has verified that Respondent is bound by the NameCheap, Inc. registration agreement and has thereby agreed to resolve domain disputes brought by third parties in accordance with ICANN’s Uniform Domain Name Dispute Resolution Policy (the “Policy”). On March 20, 2019, the Forum served the Complaint and all Annexes, including a Written Notice of the Complaint, setting a deadline of April 9, 2019 by which Respondent could file a Response to the Complaint, via e-mail to all entities and persons listed on Respondent’s registration as technical, administrative, and billing contacts, and to postmaster@adora.com. Also, on March 20, 2019, the Written Notice of the Complaint, notifying Respondent of the e-mail addresses served and the deadline for a Response, was transmitted to Respondent via post and fax, to all entities and persons listed on Respondent’s registration as technical, administrative and billing contacts. A timely Response was received and determined to be complete on March 28, 2019. On April 1, 2019, pursuant to Complainant’s request to have the dispute decided by a single-member Panel, the Forum appointed Jaime Delgado as Panelist. Complainant is an international developer and maker of creative, high quality consumer products, specializing in branded toys, fashion jewelry, collectibles, and other consumer product with an emphasis on toy dolls. Complainant has common law rights in the ADORA mark dating back to at least as early as 2000. Complainant also has rights in the ADORA DOLL mark through its registration of the mark with the United States Patent and Trademark Office (“USPTO”) (e.g. Reg. No. 3,002,445, registered Sep. 27, 2005). See Compl. Annex 1. Respondent’s <adora.com> domain name is identical to Complainant’s ADORA mark and confusingly similar to Complainant’s ADORA DOLL mark as the term ADORA is the dominant portion of the domain name and it only adds the “.com” generic top-level domain (“gTLD”). Respondent has no rights or legitimate interests in the <adora.com> domain name. Respondent is not commonly known by the disputed domain name, nor has Complainant authorized, licensed, or otherwise permitted Respondent to use the mark. Respondent also does not use the disputed domain name in connection with a bona fide offering of goods or services or legitimate noncommercial or fair use. Rather, Respondent uses the domain name to pass off as Complainant while offering links which redirect users to competing doll products. See Compl. Annexes 7 and 14. Further, for many years the resolving domain merely offered the domain name for sale, and this continued until Complainant rebuffed Respondent’s sale offer of $300,000.00. See Compl. Annexes 16 and 25. Respondent registered and uses the <adora.com> domain name in bad faith as Respondent offered to sell the domain name to Complainant for $300,000, and also advertised it for sale on the resolving domain. See Compl. Annexes 16 and 25. Further, Respondent’s use of the domain name to pass off as Complainant and offer links to competing products and services disrupts Complainant’s business and confuses Internet users as to the source of the webpage. See Compl. Annexes 7 and 14. Additionally, Respondent acquired the domain name in 2010 with knowledge of Complainant’s rights in the ADORA marks. See Amend. Compl. Annexes 19, 26, 27, 28, and 29. Alternatively, even if Respondent initially registered the domain name when it was registered in 1996, that does not permit Respondent to infringe on Complainant’s rights. Respondent has rights and legitimate interests in the disputed domain name. Respondent, Pearl One Media, is the original owner of the <adora.com> domain name and has owned the domain name for over twenty years. See Resp. Annex 1. Complainant only claims rights in the ADORA mark dating back to the year 2000 at the earliest, meaning Respondent’s registration of the <adora.com> domain name predates Complainant first claimed rights in the ADORA mark. See Resp. Annex 2. Respondent did not register or use the domain name in bad faith. Respondent’s registration of the domain name predates Complainant’s first claimed rights in the ADORA mark, and the domain name never changed ownership despite Complainant’s assertion. See Resp. Annexes 1, 2, & 5. Further, Complainant first approached Respondent to purchase the domain name, offered an amount much too low, and even stated that the domain name would not be important to Complainant’s business. See Resp. Annex 3. Respondent has a right to use the domain name as it sees fit, and one of those rights is to sell the domain name. Additionally, Respondent makes a legitimate offering with the domain name, as Respondent is a part of Amazon’s Affiliate Program. See Resp. Annex 4. Moreover, contrary to Complainant’s allegation, Respondent does not copy Complainant’s website. Respondent claims that the <adora.com> domain name was registered on July 31, 1996. See Resp. Annex 1. Complainant filed an Additional submission arguing that Respondent does not contest that Complainant proved Paragraph 4(a)(i) of the UDRP. On page 9, Section [4.] [c.] of the response, Respondent only alleges that “Complainant failed to prove (ii) and (iii),” thus constituting Respondent’s admission that Paragraph 4(a)(i) of the UDRP was met. Complainant proved that Respondent registered the domain name <adora.com> and is using the domain name in bad faith. Respondent filed an additional submission stating that Complainant has provided false evidence or attempted to mislead the Panel by making false statements. As the lawful registrant, Respondent has the right to use the domain name in connection with a bona fide offering of goods or services. Complainant added a second additional submission arguing, inter alia, that where there has been a change in registration details from one legal entity to another then in there will be a fresh registration. Complainant claims common law rights in the ADORA mark dating back to at least as early as 2000. Complainant also has rights in the ADORA DOLL mark through its registration of the mark with the United States Patent and Trademark Office (“USPTO”) (e.g. Reg. No. 3,002,445, registered Sep. 27, 2005). See Compl. Annex 1. Identical or Confusingly Similar: Policy ¶ 4(a)(i). Complainant claims to hold common law rights in the ADORA mark without any trademark registration for the term ADORA on its own. Policy ¶ 4(a)(i) does not require a complainant to own a trademark prior to a respondent’s registration if it can demonstrate established common law rights in the mark. See Microsoft Corporation v. Story Remix / Inofficial, FA 1734934 (Forum July 10, 2017) (finding that “The Policy does not require a complainant to own a registered trademark prior to a respondent’s registration if it can demonstrate established common law rights in the mark.”). To establish common law rights in a mark, a complainant generally must prove that the mark has generated a secondary meaning. See Goodwin Procter LLP v. Amritpal Singh, FA 1736062 (Forum July 18, 2017) (holding that the complainant demonstrated its common law rights in the GOODWIN mark through evidence of “long time continuous use of the mark, significant related advertising expenditures, as well as other evidence of the mark’s having acquired secondary meaning.”). Complainant claims, and provides evidence of, the following in support of its argument: (1) Complainant has made widespread use, advertising, and sales of dolls and doll accessories under ADORA mark; (2) Complainant’s products under the ADORA mark have won various awards; (3) Complainant’s products are associated with the ADORA mark; (5) Complainant hosts its website at the <adoraplay.com> domain name and, (5) Complainant has registered numerous marks consisting of ADORA as the dominant portion of the registered marks. See Compl. Annexes 1-12. Accordingly, the Panel considers Complainant’s provided arguments and evidence when determining whether Complainant holds common law rights in the ADORA mark under Policy ¶ 4(a)(i). Further, Complainant claims rights in the ADORA DOLL mark through its registrations of the mark with the USPTO (e.g. Reg. No. 3,002,445, filed April 26 2004, registered Sep. 27, 2005). See Compl. Annex 1. Registration of a mark with the USPTO sufficiently confers a complainant’s rights in a mark for the purposes of Policy ¶ 4(a)(i). See Humor Rainbow, Inc. v. James Lee, FA 1626154 (Forum Aug. 11, 2015) (stating, “There exists an overwhelming consensus amongst UDRP panels that USPTO registrations are sufficient in demonstrating a complainant’s rights under Policy ¶ 4(a)(i) and its vested interests in a mark. Due to Complainant’s attached USPTO registration on the principal register at Exhibit 1, the Panel agrees that it has sufficiently demonstrated its rights per Policy ¶ 4(a)(i).”). Accordingly, the Panel finds Complainant has established rights in the ADORA DOLL mark for the purposes of Policy ¶ 4(a)(i). Complainant next argues that Respondent’s <adora.com> domain name is identical to Complainant’s ADORA mark and confusingly similar to Complainant’s ADORA DOLL mark as the term ADORA is the dominant portion of the domain name and it only adds the “.com” gTLD. The addition of a gTLD is irrelevant under a Policy ¶ 4(a)(i) analysis. See Tupelo Honey Hospitality Corporation v. King, Reggie, FA 1732247 (Forum July 19, 2017) (“Addition of a gTLD is irrelevant where a mark has been fully incorporated into a domain name and the gTLD is the sole difference.”). Further, while Complainant does not make this specific contention, the domain name eliminates the DOLL portion of Complainant’s ADORA DOLL mark, which also is generally held to not sufficiently distinguish a domain name from a mark under the Policy. See VNY Model Management, Inc. v. Lisa Katz / Domain Protection LLC, FA 1625115 (Forum Aug. 17, 2015) (finding that Respondent’s <vnymodels.com> domain name is confusingly similar to the VNY MODEL MANAGEMENT mark under Policy ¶ 4(a)(i).). 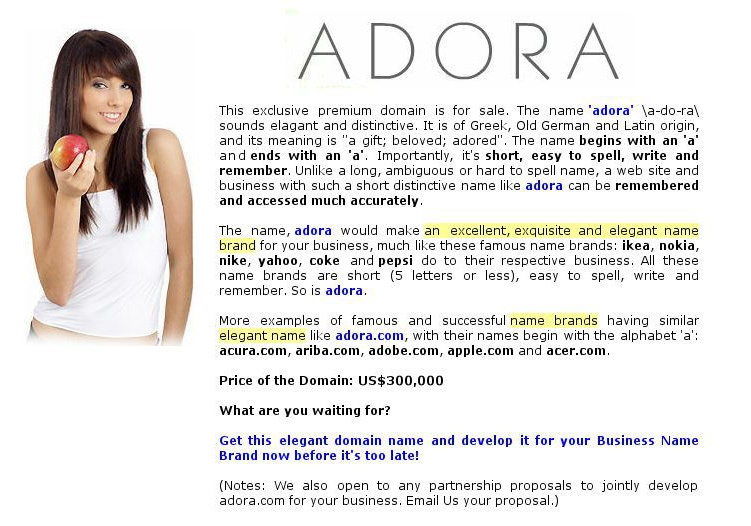 The Panel therefore finds the <adora.com> domain name is identical to the ADORA mark and/or confusingly similar to the ADORA DOLL mark under Policy ¶ 4(a)(i). Rights and Legitimate Interests: Policy ¶ 4(a)(ii). Complainant contends that Respondent has no rights or legitimate interests in the <adora.com> domain name, as Respondent is not commonly known by the disputed domain name, nor has Complainant authorized, licensed, or otherwise permitted Respondent to use the mark. Relevant information includes the WHOIS, assertions by a complainant regarding the nature of its relationship with a respondent, and other evidence in the record to support these assertions. See Amazon Technologies, Inc. v. Suzen Khan / Nancy Jain / Andrew Stanzy, FA 1741129 (Forum Aug. 16, 2017) (finding that respondent had no rights or legitimate interests in the disputed domain names when the identifying information provided by WHOIS was unrelated to the domain names or respondent’s use of the same); see also Google LLC v. Bhawana Chandel / Admission Virus, FA 1799694 (Forum Sep. 4, 2018) (concluding that Respondent was not commonly known by the disputed domain name where “the WHOIS of record identifies the Respondent as “Bhawana Chandel,” and no information in the record shows that Respondent was authorized to use Complainant’s mark in any way.”). The WHOIS identifies “Web Support / Pearl One Media” as the original registrant, and nothing in the record indicates that Complainant authorized Respondent to use the mark for any purpose. Accordingly, the Panel agrees that Respondent is not commonly known by the <adora.com> domain name under Policy ¶ 4(c)(ii). Next, Complainant argues that Respondent currently uses the <adora.com> domain name to pass off as Complainant while offering links which redirect users to competing doll products. Using a confusingly similar domain name to pass off as a complainant to advertise competing products can evince a failure to make a bona fide offering of goods or services or a legitimate noncommercial or fair use. See BALENCIAGA SA v. ling lin, FA 1768542 (Forum Feb. 16, 2018) (“The disputed domain names incorporate Complainant’s registered mark, and are being used for websites that prominently display Complainant’s mark and logo, along with apparent images of Complainant’s products, offering them for sale at discounted prices. The sites do not disclaim any connection with Complainant, and in fact seem to be designed to create an appearance of such a connection. Such use does not give rise to rights or legitimate interests.”); see also Barclays PLC v. Antwan Barnes, FA 1806411 (Forum Oct. 20, 2018) (“Using a domain name to offer links to services in direct competition with a complainant does not constitute a bona fide offering of goods or services or a legitimate noncommercial or fair use under Policy ¶¶ 4(c)(i) or (iii).”). Complainant provides a screenshot of the resolving webpage, which displays the ADORA mark and a similar color scheme as used by Complainant, and displays various doll products with links to said products. See Compl. Annex 14. Complainant also provides its own website for comparison. See Compl. Annex 7. Accordingly, the Panel finds Respondent attempts to pass off as Complainant to advertise competing products, failing to use the domain name in connection with a bona fide offering of goods or services under Policy ¶ 4(c)(i), or a legitimate noncommercial or fair use per Policy ¶ 4(c)(iii). Further, Complainant argues that, for many years, the resolving domain merely offered the domain name for sale, and this continued until Complainant rebuffed Respondent’s sale offer of $300,000.00. Offering a confusingly similar domain name for sale can evince a lack of rights and legitimate interests under Policy ¶ 4(a)(ii). See 3M Company v. Kabir S Rawat, FA 1725052 (Forum May 9, 2017) (holding that “a general offer for sale… provides additional evidence that Respondent lacks rights and legitimate interests” in a disputed domain name). Complainant provides a copy of the email thread between Complainant and Respondent, which shows that Respondent offered to sell the domain name to Complainant for $300,000.00. See Compl. Annex 16. Complainant also provides previous webpages associated with the domain name, all of which advertised the sale of the domain name for $300,000.00. See Compl. Annex 25. 22, and 25. As such, the Panel agrees and finds that Respondent offers the disputed domain name for sale, indicative of possessing no rights and legitimate interests for the purposes of Policy ¶ 4(a)(ii). Complainant claims that Respondent registered and uses the <adora.com> domain name in bad faith as Respondent offered to sell the domain name to Complainant for $300,000.00, and also advertised it for sale on the resolving domain. Offering to sell a confusingly similar domain name, either to the general public or directly to a complainant, can evince bad faith under the Policy. See Deutsche Lufthansa AG v. Kenechukwu Okoli, FA 1821759 (Forum Jan. 13, 2019) (“The domain name’s website listed the domain name for sale for $9,150. Respondent also contacted Complainant directly to offer the domain name for sale. Doing so suggests bad faith registration and use of the <lufthansamiles.com> domain name pursuant to Policy ¶ 4(b)(i).”). Complainant’s provided copy of the email thread between Complainant and Respondent shows that Respondent offered to sell the domain name to Complainant for $300,000.00. See Compl. Annex 16. Complainant also provided previous webpages associated with the domain name, all of which advertised the sale of the domain name for $300,000.00. See Compl. Annex 25. 22, and 25. As such, the Panel uses Respondent’s offering of the domain name for sale as evidence of bad faith Policy ¶ 4(b)(i). Next, Complainant claims that Respondent’s use of the domain name to pass off as Complainant and offer links to competing products and services disrupts Complainant’s business and confuses Internet users as to the source of the webpage. Using a confusingly similar domain name in a manner disruptive of a complainant’s business by trading upon the goodwill of a complainant for commercial gain can evince bad faith under Policy ¶¶ 4(b)(iii) & (iv). See Bittrex, Inc. v. Wuxi Yilian LLC, FA 1760517 (Forum Dec. 27, 2017) (finding bad faith per Policy ¶ 4(b)(iv) where “Respondent registered and uses the <lbittrex.com> domain name in bad faith by directing Internet users to a website that mimics Complainant’s own website in order to confuse users into believing that Respondent is Complainant, or is otherwise affiliated or associated with Complainant.”); see also Transamerica Corporation v. Carolina Rodrigues / Fundacion Comercio Electronico, FA 1798316 (Forum Aug. 20, 2018) (“Respondent’s use of the domain name to link to competitors of Complainant, presumably generating pay-per-click or referral fees for Respondent, is indicative of bad faith under paragraphs 4(b)(iii) and 4(b)(iv).”). Complainant provides a screenshot of the resolving webpage, which displays the ADORA mark and a similar color scheme as used by Complainant, and displays various doll products with links to said products. See Compl. Annex 14. Complainant also provides its own website for comparison. See Compl. Annex 7. Accordingly, the Panel agrees that Respondent disrupts Complainant’s business and attempted to commercially benefit off Complainant’s mark in bad faith under Policy ¶¶ 4(b)(iii) & (iv). Further, Complainant argues that Respondent had actual knowledge of Complainant’s rights in the ADORA mark at the time of the effective date of registration of the <adora.com> domain name which is 7.30.2004 as reported by the Registrar. Actual knowledge of a complainant’s rights in a mark prior to registering a confusingly similar domain name can evince bad faith under Policy ¶ 4(a)(iii). See iFinex Inc. v. xu shuaiwei, FA 1760249 (Forum Jan. 1, 2018) (“Respondent’s prior knowledge is evident from the notoriety of Complainant’s BITFINEX trademark as well as from Respondent’s use of its trademark laden domain name to direct internet traffic to a website which is a direct competitor of Complainant”). According to the Registrar’s report the effective date or registration is 7.30.2004. The Common Law rights of the Complainant and his trademark registrations on the mark ADORA precede the date of registration of the <adora.com> domain name. No evidence has been offered to show that Respondent has objected to the Registrar´s effective date of registration. See Amend. Compl. Annexes 19, 26-29. Accordingly, the Panel finds that Respondent did have actual knowledge of Complainant’s mark when it acquired the domain name in 2004, demonstrating bad faith registration under Policy ¶ 4(a)(iii). Too bad but I have little sympathy for domain owners that won’t pay for a 3 member panel. Rick – Good point. From my understanding, the Respondent didn’t even have legal representation in this UDRP.